An update to the popular photo-editing app EyeEm includes "computer vision technology." Sometimes in this life, it's necessary—we repeat, *necessary*—to stand on a chair and take 6,339,204 photos of our lunch from different angles. Shameless? Sure. Obnoxious? Maybe a little. But necessary. Especially when the lunch in question is particularly beautiful and well-lit. It's the 21st century, and photographing one's food before eating it is practically standard procedure. This reporter's done it. You've done it. Even my mom's done it. 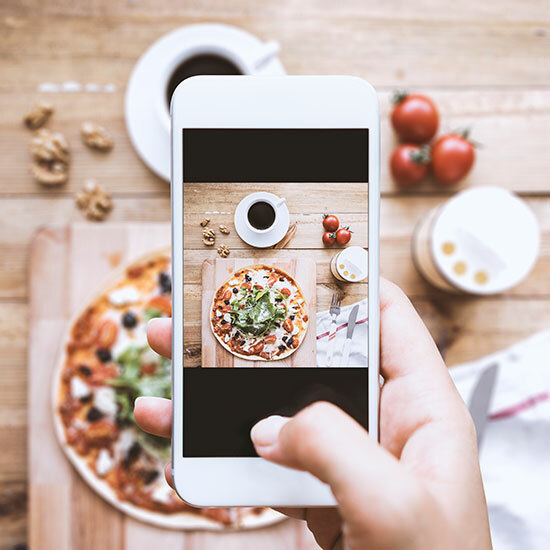 But if you think snapping photos in front of a crowd of less-than-amused fellow diners is tough, you clearly haven't dealt with the hardest part: Picking the best one to post on Instagram. After all, swiping through 6,339,204 photos is enough to make anyone's thumb cramp up. Never fear: There's a new app on the market that promises to do all that tough selection work for you. EyeEm is a pre-existing app that just released a pretty bold update. Supposedly, it can rummage through your photo library and select the best and most aesthetically-pleasing of the bunch so you don't have to. "With the new EyeEm Selects feature, your app suggests the best photos to upload from your camera roll – all powered by our computer vision technology," the brand writes in its description of the new feature. And as dubious as the name "computer vision technology" makes the whole thing sound, apparently, it actually works really well. User John Finlay gave the app a 5-star review on Thursday, citing the update as one of the reasons he enjoyed using it so much. "The new EyeEm Selects feature is wonderful," he wrote. "Really impressed with that as you can make various changes to the photo in one go and see if it gets selected or not, and looking forward to the Google Photos cloud implementation." The review is a bit mixed, though. He goes on to write that "the review process is still a bit of a joke, my photos have been reviewed in a completely haphazardous way, with many photos simply getting 'missed.'" If we're being honest, most duplicate photos we take are nearly identical to the ones before them. So, most likely, this app offers more of a psychological benefit than a game-changing, strategic benefit. Either way, we'll take the time saved and order another photogenic dessert.